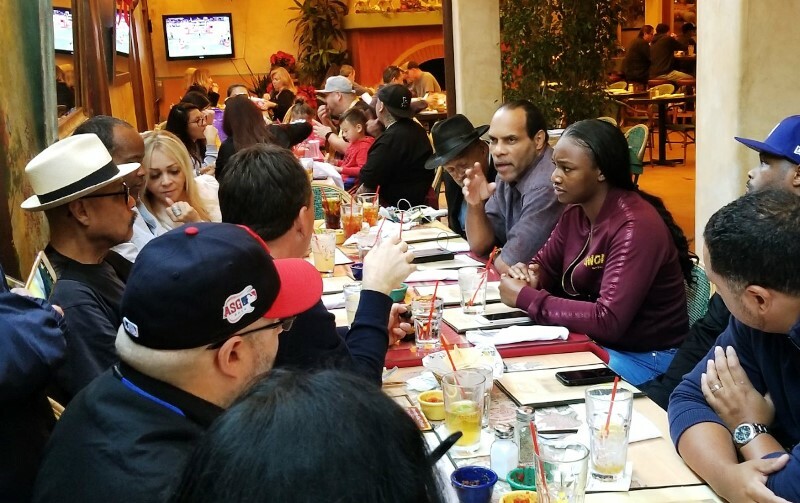 Claressa “T-Rex” Shields arrived in Los Angeles on Saturday afternoon, hopped in a car and drove to El Cholo’s restaurant where she met about a dozen media members to discuss her Southern California invasion. Flying coast to coast is nothing for the two-time Olympic gold medalist. Shields has crashed the prizefighting world with the same ferocity as she did in the amateurs. West Coast fans finally get an opportunity to see Shields (7-0) in action when she defends her three middleweight world titles against Germany’s Femke Hermans (9-1) at the StubHub Center in Carson, Calif. It’s one of three female bouts on the 360 Promotions card and will be shown on HBO on Saturday, Dec. 8. Fans of the female fight world were aware that undisputed welterweight champion Cecilia Braekhus was headlining the Los Angeles area boxing card, but those same fans were doubly excited when fellow pound for pound fighter Shields accepted a spot on the card too. With two top notch female fights on the same card, the female fight world is experiencing a revolution. Shields, 23, has been a big part of the revolution, especially after opening eyes with her Olympic accomplishments and then immediately targeting the professional fight world. Her emergence opened up the doors to television coverage for female prizefighting. It’s one of her goals not often mentioned. Two years have passed since the Michigan prizefighter made her pro debut and the female fight world has hitchhiked on her success like a magic carpet. She won world titles in the super middleweight division with ease but found it slightly tougher in the lower middleweight class. No matter. She loves competition. “I love to fight. I was born to fight,” said Shields inside the Mexican restaurant famous for its margaritas. Just two weeks ago Shields shut out Hannah Rankin and won every round. A few days later it was announced she agreed to fight on the 360 Promotions card. Before Shields, women were lucky to fight once a year let alone twice in a month. “My thing is to stay busy,” said Shields with a chuckle. Shields arrived with her trainer John David Jackson, a former super welterweight and middleweight world champion who has found success as a coach too. Both discussed their workouts and their mutual goal to win impressively by knockout. Asked to breakdown what steps are needed for her to acquire knockouts, her quick mind immediately assesses the drawbacks to giving an answer. Most boxing publications rate Shields in the top 10 pound for pound in the world of female prizefighting. It’s just a matter of time before she reaches the top. But she prefers to earn her way to the top by beating the prizefighter whom most designate as the best pound for pound fighter in the world in Norway’s Braekhus. It’s just a matter of time before Shields reaches the top. Just recently, former world titlist Louisa Hawton (8-2) was added to the 360 Promotions card at StubHub and faces local talent Lorraine Villalobos (2-1). For a while, Lawton’s fight was in jeopardy when Mexico’s Brenda Flores was forced to pull out of a rematch with the Aussie. But then Villalobos was found and she accepted the fight. Both Hawton and Villalobos have a mutual opponent in Elvia Trevino, who each defeated. Villalobos fought and defeated her twice and Lawton stopped her. It should be an entertaining clash. Their atomweight fight will not be televised. Victoria Bustos (19-5) was the victor over Enis Pacheco (17-5-2) by unanimous decision after 10 rounds on Saturday Dec. 1. The IBF lightweight world title fight took place at Santa Fe. Also, a super flyweight fight saw Roxana Bermudez (1-0-1) and Aixa Adema (2-1-2) fight to a draw. On Saturday Dec. 8, light flyweights Tamara Demarco (7-0) and Ayelin Granadino (2-0) meet in a six round fight at Saladillo, Buenos Aires. Kori Farr (3-4-2) was the winner by split decision over Krystina Jacobs (1-1) after four rounds on Friday Nov. 30. The featherweight match was held at Brisbane. Yoliane Lin De Lauf (10-2) knocked out Nino Gviniashvili (1-3-1) in the first round on Friday Nov. 30. The super flyweight contest took place at Thieu. On Saturday Dec. 8, lightweights Delfine Persoon (41-1) and Judy Waguthii (16-8-4) meet for the WBC world title at Ardooie. Persoon, 33, is making her eighth defense of the title since 2014. She has never fought outside of Belgium. On Saturday Dec. 8, flyweights Sanae Jah (15-2-1) and Nina Radovanovic (13-2) meet in a 10 round contest for the IBO world title at Brussels. Also, Djemilla Gontaruk (14-5-1) and Karina Kopinska (11-29-3) meet in a six round lightweight match; plus bantamweights Jill Serron (5-1) and Claudia Ferenczi (18-67-8) meet in a six round bout. On Saturday Dec. 8, bantamweights Mariela Valverde (5-6) and Carla Moye (0-0) meet in a four round match at Santa Cruz. Marie Eve Dicaire (14-0) defeated Chris Namus (24-5) by unanimous decision after 10 rounds on Saturday Dec. 1. Dicaire, 32, a southpaw, wins the IBF super welterweight world title that took place in her hometown Quebec. Namus, 31, had not lost since Cecilia Braekhus defeated her in February 2016. On Saturday Dec. 8, super welterweights Ivana Habazin (19-3) and Eva Bajic (14-14) meet in a 10 round bout in Zagrib. On Tuesday Dec. 4, super featherweights Maiva Hamadouche (19-1) and Viviane Obenauf (13-4) meet for the IBF world title at Paris. Hamadouche, 29, is making the fourth defense of the world title since winning it in November 2016. Alicia Holzken (1-0) won by decision over Gabriella Mezei (9-17-4) after four rounds on Saturday Dec. 1. The bantamweight fight was held in Gummersbach. Etsuko Tada (18-3-2) defeated Kayoko Ebata (12-8) by unanimous decision after 10 rounds on Saturday Dec. 1. The WBO minimum weight world title featuring several other female fights fight took place in Osaka. Wakako Fujiwara (7-2-2) beat Kimika Miyoshi (13-12-1) for the OPBF featherweight title; Eri Matsuda (2-0) defeated Minayo Kei (6-4), Kasumi Saeki (3-0) beat Wassana Kamdee (3-5) by knockout, Kanako Taniyama (1-0) knocked out Sumalee Tongpootorn (9-16-1) and Rin Murai (0-0-1) and Nami Sawai (2-1-1) fought to a draw. Erika Hanawa (10-3) won by technical knockout in round four against Jujeath Nagaowa (13-19-1) on Wednesday Nov. 28. The OPBF minimum weight fight took place in Tokyo. On Sunday Dec. 9, minimumweights Akari Arase (6-5) and Kaori Nagai (2-2-3) meet in a six round fight at Kobe. Irma Garcia (19-3-1) was the winner by split decision after eight rounds versus Irais Vargas (4-1) on Saturday Dec. 1. The bantamweight fight took place at Saltillo. Tessa Tualevao (1-6) defeated Trish Vaka (1-4) by decision after four rounds on Friday Nov. 30. The super welterweight contest took place at Auckland. Also, Karen Te Ruki (1-0) beat Toni Moki (0-1) by decision after four super lightweight rounds. On Thursday Dec.6, light heavyweights Geovana Peres (5-1) and Nailini Helu (2-4-1) meet in a eight round fight for the New Zealand title at Auckland. Eva Guzman (15-1-1) won by majority decision after 10 rounds versus Yaditza Perez (9-13-1) on Tuesday Nov. 27. The IBF minimum weight title fight took place at Panama City. Karina Kopinska (11-28-3) defeated Panagiota Marmali (0-1) by decision after four rounds on Saturday Dec. 1. The welterweight fight was held in Katowice. Kirstie Gannaway (1-0) beat Febriyanti Lubis (1-3) by decision after four rounds on Friday Nov. 30. The flyweight match was held in Singapore. On Friday Dec. 7, super lightweights Sarah Achieng (12-2) and Hedda Wolmarans (4-0) meet in a six round fight at Brakpan. On Saturday Dec. 8, bantamweights Soo Rin Kim (1-0-1) and Ji Young Suh (1-0) meet in a four round bout at Seoul. Joana Ekedahl (8-0) was the winner by decision after six rounds versus Nina Pavolovic (1-2-1) on Saturday Dec. 1. The lightweight match took place at Skovde. Vissia Trovato (12-0) defeated Irma Adler (16-11) by decision after eight rounds on Saturday Dec. 1. The featherweight clash took place in Ascona. On Saturday Dec. 8, flyweights Gabriela Timar (0-0) and Rozmari Silyanova (0-2-1) meet in a four round fight at Basel. Saida Bukvic (1-0) decisioned Ksenija Medica (0-11) after four rounds on Saturday Dec. 1. The featherweight fight was at Istanbul. Anelle Massey (0-0-1) and Vaida Masiokaite (1-1-1) fought to a draw after four rounds on Saturday Dec. 1. The lightweight fight took place in London. On Saturday Dec.8, lightweights Terri Harper (4-0) and Feriche Mashauri (6-1) meet in a six round fight at Sheffield, England. Tori Nelson (19-2-3) defeated Sanna Turunen (4-2-1) by unanimous decision after 10 rounds on Saturday Dec. 1. The UBF middleweight title fight took place in Washington D.C.
Schemelle Baldwin (3-0) won by knockout in the first round over Crystal Byers (0-5) on Saturday Dec. 1. The middleweight match took place in Hockessin, Delaware. On Friday Dec. 7, featherweights Ronica Jeffrey (16-1) and Edina Kiss (15-8) meet in a six round fight in Queens, New York. On Friday Dec. 7, super flyweights Ava Knight (16-2-4) and Mayela Perez (19-22-4) meet in an eight round bout in Las Vegas, Nevada. On Friday Dec. 7, welterweights Christina Campfort (4-2-1) and Nina Gallegos (0-2) meet in a four round bout in Tampa, Florida. On Friday Dec. 7, featherweights Cristina Fuentes (9-10-6) and Brittany Ordonez (2-2) meet in an eight round title contest in Laredo, Texas. On Saturday Dec. 8, welterweights Cecilia Braekhus (34-0) and Aleksandra Lopes-Magdziak (18-4-3) meet in a 10 round fight for the undisputed welterweight championship in Carson, Calif. Also, middleweights Claressa Shields (7-0) and Feke Hermans (9-1) meet in a 10 round bout for the WBC, IBF and WBO world titles; and Louisa Lawton (8-2) and Lorraine Villalobos (2-1) meet in a 10 round atomweight fight. The two world title fights will be televised by HBO. On Saturday Dec. 8, featherweights Tiara Brown (6-0) and Dahiana Santana (36-10) meet in a 10 round contest at Bowie State University at Bowie, Maryland. Luisana Bolivar (9-5-1) knocked out Yoselin Molina (0-1) in the first round on Monday Nov. 26. The flyweight match was held in La Victoria.